Statutory information required by state licensing – This information may include immunization records, background check, related certifications, and in some cases CPR and first aid certification. Basal Bachelor’s Degree in early childhood education – This requirement may vary, depending on the teacher’s role, but is the baseline education requirement for accredited professional preschool teachers. Please note that because of the highly diverse range of preschool teaching roles , this is a basic profile sample only. Specialist teachers will require a range of additional qualifications, experience, and related skills in their areas of teaching. Name/contacts – Your first and last names, email and phone. Personal profile/objectives/ summary – Ensure that you accurately provide your personal profile in the form of a useful introduction to yourself. Skills –Please note that skills listings are required to address a particularly wide range of skill sets, including communications, creativity, interpersonal skills, and practical organizational skills. Formal qualifications and certifications – As described above, be sure when completing your resume to ensure that all formal qualifications and certifications are addressed. Employment history – Another critical part of the best resume format, the employment history section may also include mandatory requirements like experience in preschool environments. It’s advisable to ensure that your resume fully describes and defines your experience. If you’re not sure what specific experience is required, contact the employer. A word of warning at this point – All jobs require different resumes. Don’t send in a generic resume, because it won’t cover the specifics of different jobs. You will need to use a targeted resume which will address all aspects of each jobs for which you apply. This is actually pretty easy to do, particularly using a functional resume format like the one above. Skills – Focus on the critical skill sets which show clear performance indicators. Build on your strongest skill sets to make your resume competitive. The core skills of communications, creativity, interpersonal skills, and practical organizational skills are good material to show your abilities. Experience – Relevant experience is critically important. You need to show clearly defined experience which shows your suitability for the job. You can use examples from different jobs, for example, to highlight your skills in these areas. The tips provided above can be partly applicable to a resume for a music teacher, or Dutch resume so don’t hesitate to follow them. Anticipated growth in jobs for preschool teachers in the US in the decade 2012 to 2022 is 12%, or 188,400. This figure is based on weighted averages used to project future growth and is intended as a guide only. Job increases may vary depending on location and sample differentials. 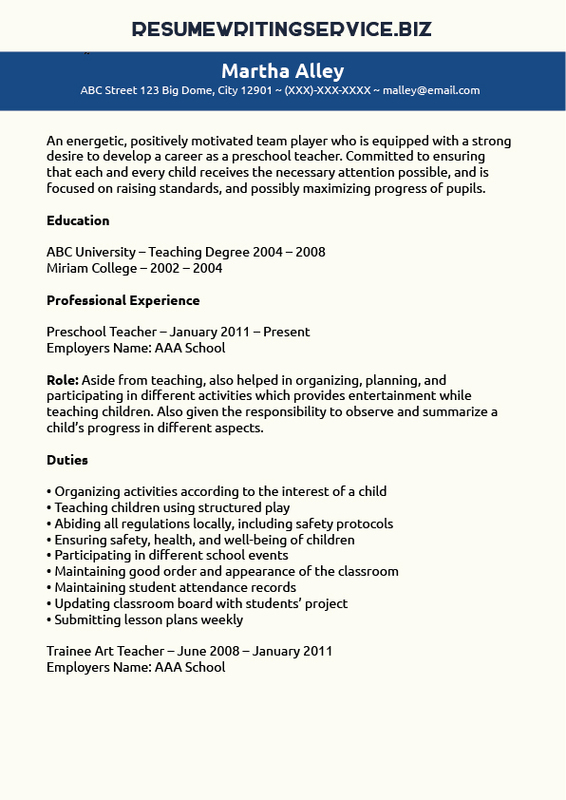 If you need help with a preschool teacher resume, feel free to contact us anytime!